I retain three indelible images from that time. The first: the legions of Ivy Leagueand other Western-educated "experts" who roamed the halls of the Kremlin and the government, offering advice, all ultimately ineffective, on everything from conducting free elections to using "shock therapy" to juice the economy to privatizing state-owned assets. The second: the long lines of impoverished old women standing in the Moscow cold, selling whatever they could scrounge from their homesa silver candleholder, perhaps, or just a pair of socks. The third, more familiar image: a discouraged and embattled Yeltsin in 1993 calling in Russian-army tanks to shell his own parliament to break a deadlock with the defiant legislature when everything he was trying to do was going wrong. Yeltsin bombed his way out of the threat of civil war and managed to hang on to power, but Russia was left hobbled. Virtually every significant assetoil, banks, the mediaended up in the hands of a few "oligarchs" close to the President. Corruption and crime were rampant; the cities became violent. Paychecks weren't issued; pensions were ignored. Russia in 1998 defaulted on its foreign debt. The ruble and the financial markets collapsed, and Yeltsin was a spent force. "The '90s sucked," says Stephen Sestanovich, a Columbia University professor who was the State Department's special adviser for the new Independent States of the former Soviet Union under President Bill Clinton. "Putin managed to play on the resentment that Russians everywere were feeling." Indeed, by the time Putin took over in late 1999, there was nowhere to fall but up. That Russia needed fixing was acknowledged by all. But how was it that Putin got the call? What was it that lifted him to power, and to the dacha in Novo-Ogarevo? Putin's rise continues to perplex even devoted Kremlin observers. He was born into humble circumstances in St. Petersburg in 1952. His father had fought in World War II and later labored in a train-car factory. Putin's mother, a devout Orthodox Christian, had little education and took on a series of menial jobs. The family lived in a drab fifth-floor walk-up in St. Petersburg; Putin had to step over swarms of rats occupying the entranceway on his way to school. Putin's only ancestor of note was his paternal grandfather, who had served as a cook for both Lenin and Stalin, though there's no sign that this gave his family any special status or connections. Putin describes his younger self as a poor student and a "hooligan." Small for his age, he got roughed up by his contemporaries. So he took up samboa Soviet-era blend of judo and wrestlingand later just judo. From all accounts, he devoted himself to the martial art, attracted by both its physical demands and its contemplative philosophical core. "It's respect for your elders and opponents," he says in First Person, his question-and-answer memoir published in 2000. "It's not for weaklings." It was the KGB that rescued Putin from obscurityand turned the child into the man. Putin had begun to apply himself to schoolwork, and in 1975, during his senior year at Leningrad State University, he was approached by an impressive stranger who said, "I need to talk to you about your career assignment. I wouldn't like to specify exactly what it is yet." Putin, who had dreamed of becoming a spy, was intrigued. Within months he was being trained in counterintelligence. By the mid-1980s he was assigned to East Germany, where he worked undercover, pursuing intelligence on NATO and German politicians. He was in Dresden, not Berlin where the action was, and probably would have been only a bit player in the Le Carré version of the cold war. But when the Berlin Wall came down in 1989, so did Putin's KGB career. As angry crowds moved on the local KGB headquarters, Putin and his colleagues feverishly burned files that detailed agents' names and networksso much paper, he recalls in the memoir, that "the furnace burst." Then he slipped into the crowd and watched as the newly liberated mobs sacked the detested building. Within two years, he left the KGB altogether. Putin's big break was a friend's introduction to Anatoli Sobchak, the liberal mayor of St. Petersburg, who was happy to bring in an intelligent, no-nonsense outsider to help push his reformist agenda. 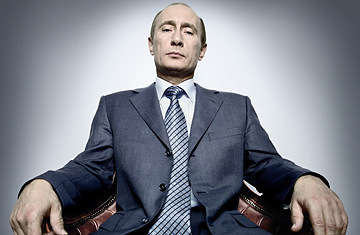 Putin ran the office that registered businesses and promoted foreign investment. He was responsible for ensuring that President Clinton's visit to the city in 1996 went smoothlyit was the first time American officials saw Putin in action. But later that year, Sobchak, damaged by a perception of ineffectiveness and rumors of corruption, lost his re-election bid. As Putin tells us at the dacha, as a member of the losing team, he was suddenly untouchable. "Nobody would hire me there," he says. So Putin headed to Moscow. What transpired next seemed to Kremlin watchers as unlikely as Chauncey Gardiner's unwitting rise to power in the Jerzy Kosinski novel Being There. Although Putin often says that he had no connections when he arrived in the capital in mid-1996, he had several powerful allies who landed him work in the Kremlin. He became deputy to the head of Yeltsin's general-affairs department. Within two years he was asked to head the FSB, the spy-agency successor to the disbanded KGB. Putin, in his memoir, says he received a call out of the blue asking him to head to the airport to meet Russia's Prime Minister, Sergei Kirienko. Kirienko offered congratulations. When Putin asked why, he replied, "The decree is signed. You have been appointed director of the FSB." Then, in August 1999, Putin was named Prime Minister. It's a grand title, but it doesn't come with much security: Putin was Yeltsin's fifth Prime Minister in 17 months. But Putin did far better than survive; within four months a declining Yeltsin asked Putin to take over as acting President. Putin tells us he initially declined but that Yeltsin raised it again, saying, "Don't say no." By the last day of 1999 Putin was running the country. We ask if it had ever occurred to Putin that history would place him in such a role. "It never occurred to me," he says. "It still surprises me."